Men's trousers with elastic on both sides. Fastens with button on the front. Men's classic trousers. Fastens with button and zipper. 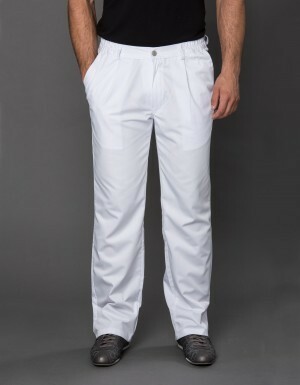 Ladies white trousers with elastic on the back, belt loops and zipper on the side and sewn-in front creases. Ideal trousers for a classic uniform. Ladies black trousers with elastic on the back, belt loops and zipper on the side and sewn-in front creases. Ideal trousers for a classic uniform.